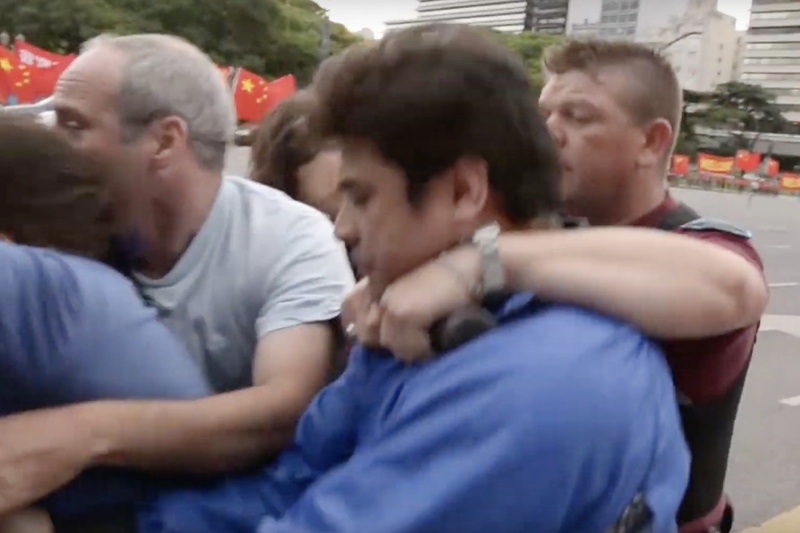 Demonstrators peacefully protesting human rights abuses by the Chinese regime ahead of the G-20 summit in Buenos Aires, Argentina, were arrested and detained after being told by police they were not permitted to protest the Chinese communist regime. Practitioners of the spiritual discipline Falun Gong gathered on Nov. 29 near the Sheraton Buenos Aires Hotel, where Chinese leader Xi Jinping stayed, to protest the communist regime’s 19-year suppression of their faith. About a dozen demonstrators stood behind metal barricades and held two banners calling for an end to the persecution of Falun Gong in China. 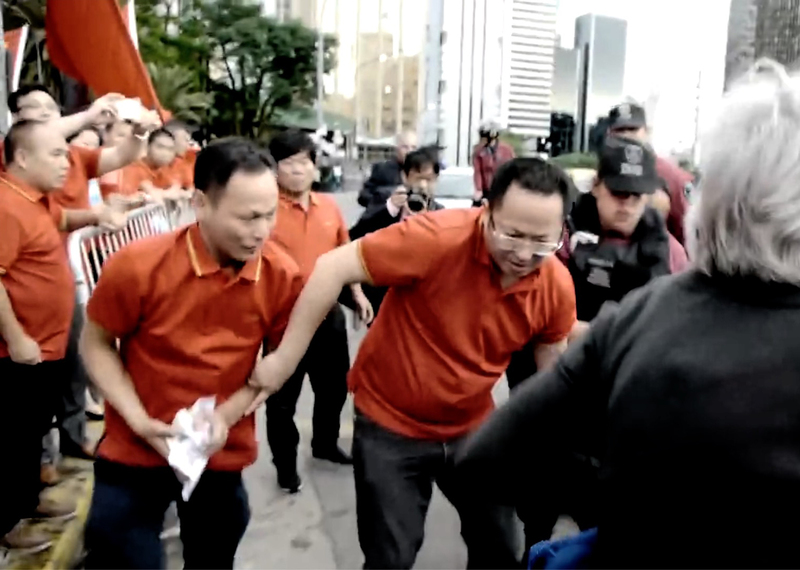 Footage of the incident obtained by The Epoch Times shows several police officers confiscating the banners, which escalated to a situation akin to a “tug-of-war,” with police on one side and demonstrators on the other pulling on the banner. The demonstrators can be heard imploring the police to stop, while police can also be seen addressing the demonstrators. A demonstrator involved in the incident, Natividad Almaraz, 25, said a male police officer told her they were told the demonstrators were not allowed to be there because they were protesting against the Chinese regime. 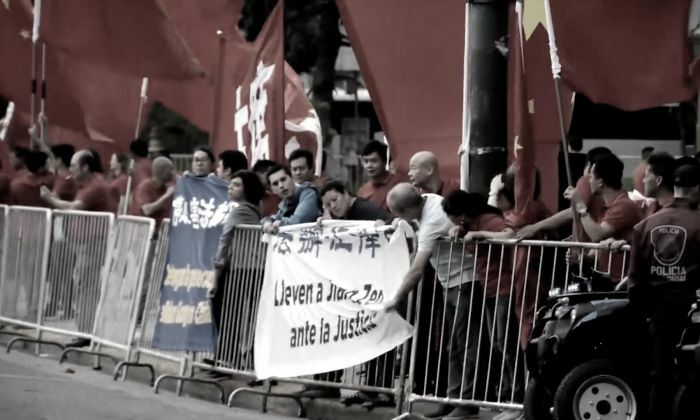 The demonstrators were surrounded by hundreds of Chinese Communist Party (CCP) supporters, wearing red polo shirts and waving large Chinese flags. Such groups are known to be organized by local Chinese embassies when CCP leaders go on state visits. 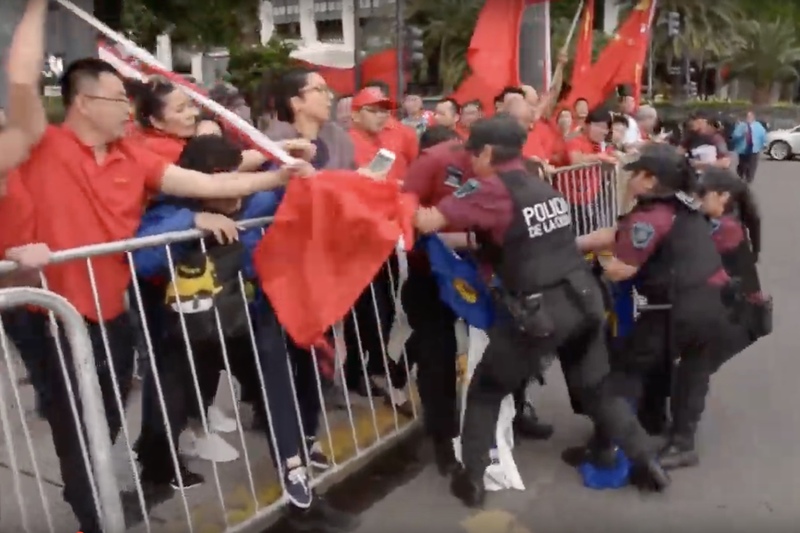 In the video, one man from the pro-CCP group jabs his flagpole into the tussle in an apparent attempt to get the demonstrators to release their banner. Later on, several members of the CCP’s group can be seen quickly grabbing and balling up flyers dropped from the bag of a practitioner. During the incident, a male police officer can be seen using his baton to hit the hands of the demonstrators holding the banner. The same officer can later be seen using his baton to form a chokehold around a male demonstrator to try to get him to release the banner. At one point, the officer-in-charge tells the cameraperson, “[He or she] attacked a police officer,” as apparent justification for the arrests. Nine demonstrators were arrested and detained overnight at a local police station. They were released in the afternoon of the following day without charges. Almaraz said that after the incident, a female police officer told her that she couldn’t help the demonstrators as the orders to stop them came from above, and there is a lot of corruption. “The policewoman told me, ‘I know what [Falun Gong practitioners] do is good,'” Almaraz said. Fu Liwei, another Argentine Falun Gong practitioner present during the incident, said that when she arrived at the demonstration, staff from the Chinese Embassy followed her and asked the police to arrest her. “I asked a police officer, ‘Are you monitoring me or protecting me?’ He said, ‘Both,’” Fu said. Sebastian Arcusin, one of the practitioners who was arrested, said the demonstrators were doing nothing illegal—they were peacefully protesting and calling for an end to the persecution in China. “In China, our fellow practitioners are persecuted. They are tortured. Their organs are harvested. It’s genocide!” Arcusin said. Falun Dafa, also known as Falun Gong, consists of five meditation exercises and is based on the principles of truthfulness, compassion, and tolerance. According to Minghui.org, a clearinghouse for information about the persecution, Falun Gong is practiced by tens of millions of people in more than 110 countries worldwide. Former CCP leader Jiang Zemin initiated the persecution in 1999. The sweeping repression has led to the confirmed deaths of more than 4,200 Falun Gong practitioners in China due to torture and abuse, though the actual number is suspected to be far higher. Large numbers are suspected to have been killed through having their organs harvested. Researchers have described this forced organ harvesting as a cold genocide. The G-20 Summit 2018 was held in Buenos Aires, Argentina, from Nov. 30 to Dec. 1.